4Eeasysoft HD Converter is one professional HD video Converter to convert HD DV, HD TS, MTS, M2TS, HD MOV, HD H.264, HD RM and other HD videos to standard definition (SD) video, and convert to HD video without the complexity. This HD Converter also assists you to convert among general videos or SD videos, like AVI, WMV, 3GP, MP4, FLV, SWF, ASF, etc. 4Easysoft HD Converter gives you a hand to control over the video quality with professional editing tools. So you are available to get video clips, crop the video play region, check "Merge into one file" to get one successive video, add watermark, set video/audio settings, and so forth. 4Easysoft HD Converter makes it easy to obtain different formats files from source after converting once. 4Easysoft HD Converter makes it easy to put converted video on iPod, iPod touch, iPod nano, iPod classic, iPhone, iPhone 3G, Apple TV, PSP, PS3, Xbox 360, Zune, Archos, Sandisk, iRiver, Creative Zen, MP4/MP3 Player, Smart Phone, Pocket PC, Mobile Phone, etc. 4Easysoft HD Converter allows you to set the video Brightness, Contrast, Saturation. Checking Deinterlacing helps you to convert interlaced video to the progressive video, this function can optimize the video effect. 4Easysoft HD Converter doubles your enjoyment with joining several interesting video clips into one. Crop frame size to remove your unwanted area using this HD Video Converter like the smart scissors.You can also adjust video aspect ratio with 4Easysoft HD Converter. This HD Video converter enables you to take snapshot of your favorite image. It can be saved in default folder automatically. All the Video Encoder, Resolution, Frame Rate, Video Bitrate, Audio Encoder, Sample Rate, Channels,and Audio Bitrate are provided by 4Easysoft HD converter for you to choose. You also can save all the output settings as your preference, which is saved in the user-defined column automatically. 4Easysoft HD Converter allows you to preview the original video and the instant output video for your operation at the same time. 4Easysoft HD Converter possess the intuitively user interface, which brings you more convenience and enjoyment. With professional video encoding and decoding technique, 4Easysoft HD Converter brings you the advanced and high speed converting process. The quality of the converted vide is excellent. This HD Video Converter enables you to add text or picture watermark, and adjust the verticle and horizontal position and transparence of watermark. 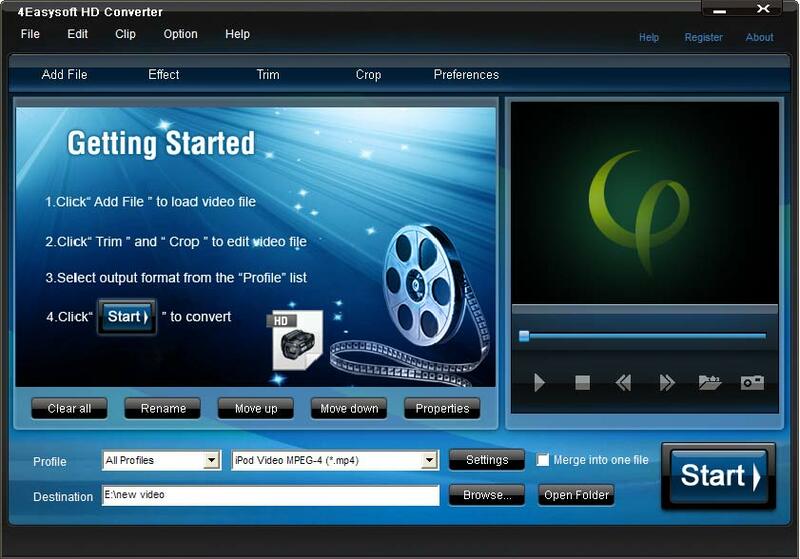 With 4Easysoft HD Converter, you can convert one video to different formats files for one time conversion. It gives you the right to choose your preferred subtitle and audio track. How to convert and edit HD videos?